Blue Heron Cove is a small Gulf Breeze subdivision in the Villa Venyce community, located right next to the Naval Live Oaks Nature Preserve on just two streets - Grand Canal and Vestavia Way. The homes here are either direct channel front or with views of a series of canals which connect to Santa Rosa Sound. The canal offers direct access to the deep water of the Sound and is perfect for the boating enthusiast and only a few blocks off Hwy 98. The homes in Blue Heron Cove are custom-built luxury estates, with large lots along the canal, and most have elaborate outdoor entertaining areas, often a private pool, hot tub, covered lanai, screened porch, or all of the above. The waterfront homes have boat houses, launches, and lifts with room for several boats. You will find single and two-story homes, brick, siding, or stucco. Variety is the word here, except for the luxury. Prices average from $600,000 to just over a million, although a few of the homes that are not direct waterfront start at $300,000. All the homes have everything you could want, with tropical landscaping and at least a view of the canals. Children attend Gulf Breeze Elementary, Middle, and High Schools. Building began in Blue Heron in the mid 1980's, and there are homes built in the 1990's, 2000's, and an occasional one that is almost new. 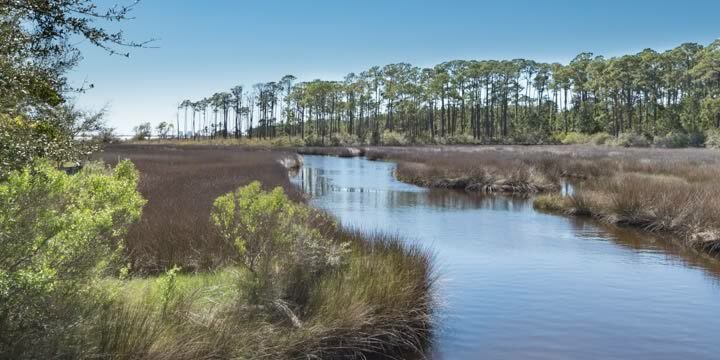 If you are looking for a waterfront home that will be the envy of everyone, the homes in Blue Heron Cove should be on your list to see first. Call Emerald Coast Realty to tour this beautiful Gulf Breeze waterfront community.